Over the decades, dental implants have been helping people replace missing teeth. As a result, their bite is stronger and their confidence is given a well-deserved boost. However, many people still aren’t aware of the versatility dental implants can offer, especially for those who currently wear either full or partial dentures in Longmont. After placing your implants and crafting a denture designed to fit with them, your quality of life will notice significant improvements. Consider your options today! One of the most popular implant-retained denture options available today is a removable overdenture. This option involves the creation of a custom prosthetic that’s fitted with sockets for implants to connect too. Because the denture is removable, cleaning the restoration as well as your gum tissue and abutment is a relatively straightforward process. In order to best care for an overdenture, you’ll need to remove it daily to practice oral care. Cleaning the denture involves brushing it with a denture-friendly cleaning solution and soaking it in cool water when not in use. This prevents the denture from changing shape over time. 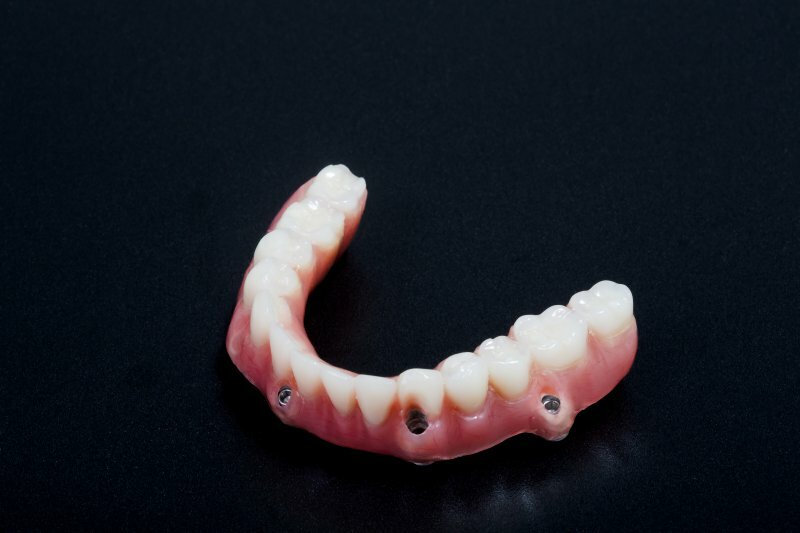 While overdentures do offer a more comfortable fit, it’s important that you visit the dentist as recommended (typically every six months) or when an issue develops with your comfort or fit. The fixed option for implant-retained dentures offers a solution for those who want to avoid removing their denture altogether. Fixed dentures are designed to stay in the mouth and only be removed by the dentist for replacement or deeper cleaning. You’ll still need to practice daily oral care, but there’s no need to soak your denture or clean it outside of your mouth. It’s clear that both removable and fixed implant-retained dentures offer many benefits to those suffering from tooth loss. Below is a list of just a handful of the benefits you can expect after your treatment. The solution you choose should be made with the dentist’s recommendation in mind. For one, those who don’t have as much bone available may prefer a removeable overdenture as it doesn’t require as many implants to place. In contrast, those who have lost most or all of their teeth but also have sufficient bone volume may benefit from fixed dentures. It’s worth noting that even though removeable dentures do require more maintenance, they are easier to keep clean compared to fixed solutions. The best way to learn for sure is to schedule an implant consultation with a dentist. Stop by an office today and get started enhancing your smile! Dr. Dan Maurer earned his DDS degree from the University of Colorado School of Dental Medicine. His office provides many different types of dentures and implant-related solutions to tooth loss. To learn more about his practice, you can contact him through his website.